This nail art craft project shows you how to use a hammer and nails to make a beautiful flower bouquet. 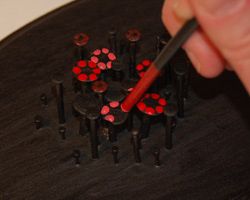 Regular nails are hammered into a wood plaque and painted to look like flowers. 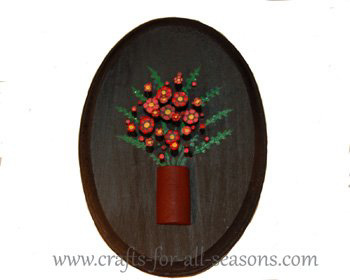 The final result is amazing because the flowers and vase have a three dimensional effect. This would be a wonderful Mother's Day gift for Mom, or a special gift for anyone who loves flowers! This project is a bit more challenging. An older teenager that is responsible with a hammer and nails can make one easily, but this project isn't safe for the younger ones. 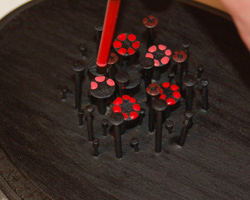 Other than pounding in the nails, the artwork needed is very easy, and I explain how to do everything step by step. 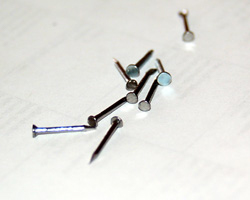 Various size nails, in different lengths, and with different size heads. It is important to have some larger head nails to have the best effect. 1. Nail art requires a variety of nails. You will need several with large heads on them (I used seven). Use some tiny short nails, and some medium length nails. 2. 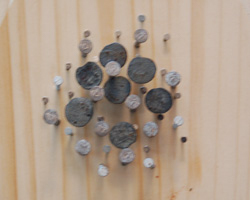 Begin to pound the nails into the wood using a hammer. 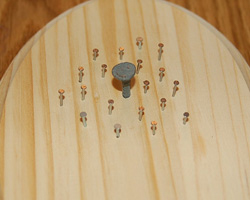 It is important to take your time and pound lightly, and be sure the nail goes in straight. If it starts to go crooked, stop and fix the angle by tapping the nail on the side. 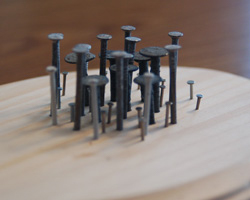 You want the nails to be different heights in the wood for the 3D effect. Begin by tapping in one of your your largest head nails first, right where you want to center of your bouquet to be. This will be the center to work around. Next, start to hammer in all of your shortest nails. Just scatter them around the large nail, where you want the bouquet to be. 3. 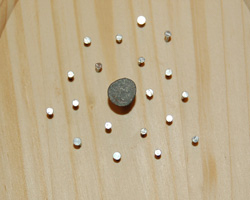 Next, pound in the medium height nails, and scatter them throughout the bouquet. End with your tallest nails. Here are photos of the placement I used for my nail art, and a side view to show you the various heights. 4. Spray paint the entire wood plaque black. You will probably need a couple coats to cover everything enough. Make sure the wood between the nails, and the sides of the nails themselves, all get covered in black. Allow this to dry well. 5. To paint the flowers on your nail art, use the back of your paintbrush and dip it in some acrylic paint. 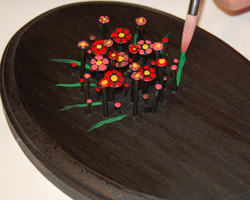 Use the back of the paintbrush to make dots for the petals. I used the color red, then made a lighter shade and darker shade of red by adding in a little white and black. I used yellow paint for the middle of the flowers. The very tiny nail heads can just be painted over with one color, since they are too small to actually paint a flower on them. 6. Use some green paint and add some greenery in the background, or none at all... this is your personal creation! 7. 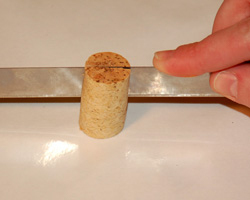 For the vase, cut the cork in half lengthwise using a razor blade. 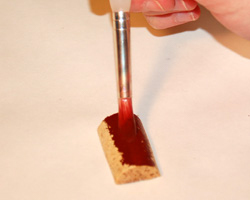 Then paint the cork with acrylic paint and allow to dry. When it is dry, you can hot glue this to the bottom of the flower bouquet. 8. When the nail art plaque is dry, you can add a picture hanger to the back for hanging. "I am attaching a picture of something I made back in High School (the 1970's). 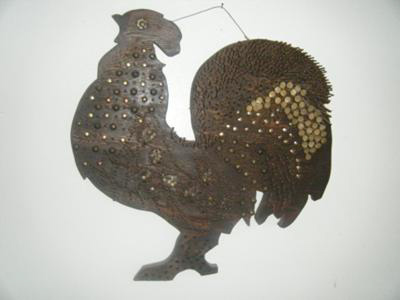 Nails and tacks were hammered into a wooden rooster plaque. I am looking to make something again similar to this but I cant find a pattern anywhere. Your's is the closest thing I have found. Does anyone have any ideas where I could find more patterns? I'm not looking for string art though. Any leads would be greatly appreciated. 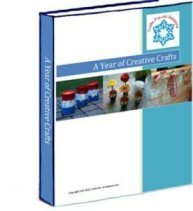 Please email Crafts For All Seasons with any info. Thank you!"